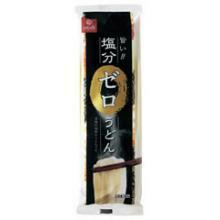 I developed it for a person worried about salt <dried noodles of the salt nonuse>. Salt begins to dissolve in boiling hot water when I boil udon, but, in fact, does not finish completely usually falling out! Approximately 0.5 grams remains to the noodles (I calculate it than Standard tables of food composition in Japan. Boil it dried udon <;) per >100 g. If it is this product of the salt nonuse, you can have it in "salt zero" in peace. Even salt nonuse is finished to udon with the elasticity by the making of cloth, the はくばくこだわりの Taka water two steps aging manufacturing method to let you have the waist which you did well plumply <as for the taste just>.